DIARY OF A PUBLIC SCHOOL TEACHER! : Improving as a Teacher: Reflecting on Student Responses to Class End of Year Survey! Improving as a Teacher: Reflecting on Student Responses to Class End of Year Survey! I got the idea to create surveys from Pernille Ripp. She is a huge fan of using surveys to help her reflect on how to gauge just about anything. I created a beginning of the year survey based on questions she wrote, putting them in Google forms. I decided this year that I would create an end of the year survey, something I usually never get around to. It became a simple task after reading an article on self-reflection by Vicki Davis. I used, and modified some of the questions she asked to create my survey. The questions I asked gave me insight into my students' thoughts in a way that I wouldn't have achieved sitting down with them one by one. I emphasized to my students that the survey could be anonymous, and some of them took advantage of that option. I was looking for honesty. "Not yell because that makes us kids mad and sad. "Here's the thing, I don't yell. At least that's what I thought. I know there are times when I have raised my voice. When I get frustrated, my voice gets louder. Note to self: Work on not yelling. "I wish we had more time for Mystery Skypes." My students love Mystery Skypes! Yeah! They would have loved more Mystery Skypes. Will definitely have to work on that next year. "The Reading packets were so long and gave me headaches". I feel them on that one. I hate Reading packets with a passion! However, we switched to Common Core, and were given no resources. I spent so much time at the copier. smh Thank goodness, my team is working on rectifying that situation. We want books!!!! "Work more with the students in the back to help them more with their work." I felt really bad when I read this one. It was anonymous, so I'm guessing that it was one of the kids I pulled for small group. Obviously, they don't feel I gave them enough attention to help them through.I will have to implement more strategies to make sure they really comprehend for the long term, not just while they are at the back table. "More time to study...two days after we learn it, we have a test." This student is absolutely correct. Don't they know I have to collect data, so that when I attend PLC, I have data to go over with the team? What's wrong with that kid? All kidding aside, this is definitely something I have to work on. After all, who am I here for? "Giving more students more responsibilities and trusting them with more tasks. After all, we are 5th graders." And all this time I was thinking that I was doing great in that department! More than one student said this, so it leads me to believe that I am not as great at trusting them as I thought I was. However, I know we all have room for improvement. When it's time to go back, I'm going to reread this post, take another look at the survey responses, and make adjustments in the new year! Labels: end of year student survey, improving as a teacher, surveys in the classroom, teacher self-reflection, using Google forms in the classroom. I love your idea of administering an end of the year student survey. It reminds me of course/instructor evaluations we had to complete in college. It's a great way to reflect and make changes for the next year. It also shows students that you took the time to ask for their input - the good and not so good. Best wishes! 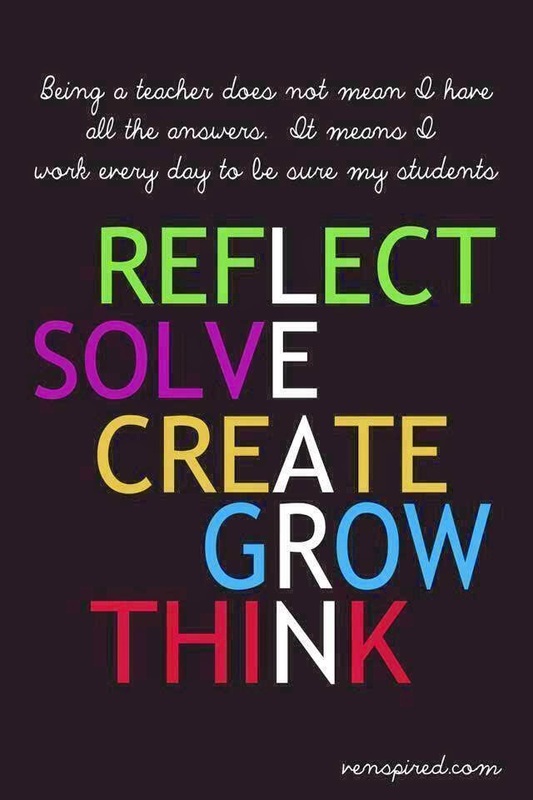 I think this is an awesome way to reflect and improve.